On this page, you can read about the history of SEAOI, see a list of our Past Presidents, and learn about the sculpture honoring Dr. Fazlur Khan. The Structural Engineers Association of Illinois (SEAOI) was founded in 1965 by several practicing structural engineers including Frank Cooper, George Ellis, Nissim Eskenazi, Henry Miller, Ken Naslund, John Parmer, and Frank Wells, the first President. Those founders and others envisioned an organization that exchanged information specifically of interest to structural engineers practicing in the State of Illinois. They also wanted to reinforce their rights as defined in the Structural Engineering Practice Act. In addition, they saw the need to present lectures and conferences that provided useful information to practicing structural engineers that was different from or supplemental to the typical education the civil engineering coursework provided at universities. Over time, SEAOI’s scope of programming grew to include dinner meetings, the Refresher Course (for the SE exam), Trade Shows in Chicago and Springfield, the Bridge and Structures Symposia and also the annual Awards program. As SEAOI looked to expand its legislative activities, it developed the Structural Engineers Political Action Committee, or SEPAC. The organization also developed the Structural Engineers Foundation (SEF) which offers semi-annual lectures that are free to the public and an annual scholarship program for structural engineering students. In addition, SEF sponsors the John Parmer award, which recognizes individuals whose careers are deemed to be examples of excellence. In 2015, SEAOI celebrated our 50th Anniversary. The day of our Annual Awards Banquet, June 6, 2015, was declared Structural Engineering Day in Illinois by the Governor. As part of the celebration, SEAOI gathered nominations from members and selected 50 Significant Structures in 50 Years, to commemorate the achievements of the engineering community over the last five decades. 1992-93 Clyde N. Baker, Jr.
by Robert B. Johnson, S.E., P.E. 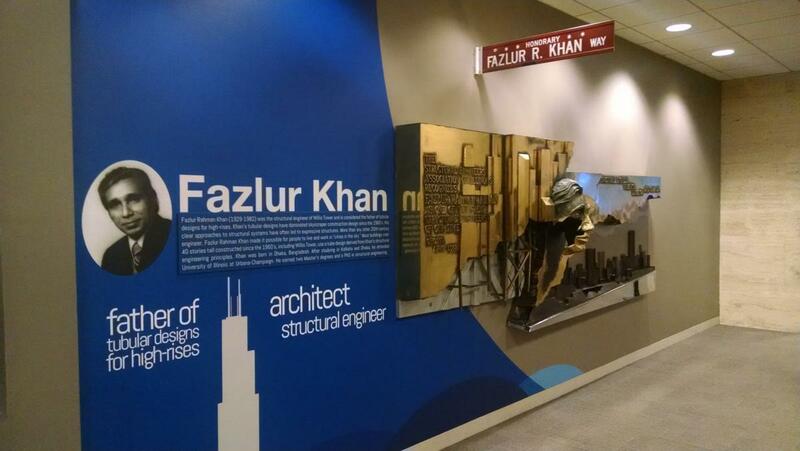 Considering Dr. Khan's contribution to the structural engineering profession, the Structural Engineers Association of Illinois (SEAOI) believed a lasting tribute to his achievements was warranted. In the mid 1980's SEAOI began a fund-raising effort to subsidize the creation of a sculpture to honor Dr. Khan. Simultaneously, efforts were begun to locate a site for exhibiting the sculpture. By 1987 over $20,000 had been raised; and SEAOI member Jaime Moreno was able to obtain the services of renowned Spanish artist Carlos Marinas to design and fabricate a large bas-relief made of stainless steel and bronze. The sculpture featured a bust of Dr. Khan set alongside a representation of Chicago's skyline, which includes many of the buildings designed by him. A section of the skyline was cut-a-way, expressing the artist's interpretation of structural systems for the buildings. In the early part of May, 1988 the sculpture was completed and shipped to Chicago from Spain. On May 20, 1988, SEAOI held a reception in the lobby of an office building at 222 North LaSalle, Chicago, to announce the arrival of the sculpture in Chicago. Artist Carlos Marinas was present at the unveiling. A public relations blitz preceded this event. Illinois Congressmen, Henry J. Hyde and John Edward Porter, read statements into the Congressional Record (May, 17, 1988 and May 10, 1988 respectively) announcing the reception and the achievements of Dr. Khan. Acting Mayor of Chicago, Eugene Sawyer, proclaimed Friday, May 20th, 1988 as "Dr. Fazlur Rahman Khan Day in Chicago". Illinois State Senator Bob Kustra and former Lieutenant Governor of Illinois offered Senate Resolution No. 991 honoring the feats of Dr. Khan. As public relations chairman for SEAOI, I personally invited key representatives from Chicago's media and expected a contingent of Chicago's press, including television reporters. At the reception SEAOI president Jon Boyd remarked, "This is not a memorial,... but a celebration. Fazlur's Memorial is all around us today. It is in the skylines of our cities, in the legacy of his work and teaching, but most importantly, it is in the minds and hearts of those who knew him." Unfortunately, those words went unreported by the Chicago press, because, on that same day, a deranged woman invaded a suburban Chicago grade school brandishing a gun and shooting children. At least one child was killed and several were wounded. The sculpture remained on display in the lobby of the 222 North LaSalle office building for several weeks. SEAOI attempted to locate a site for permanent display. In September 1988 the sculpture went on display in the lobby of City Hall. At this time one of the political writers for the Chicago SUN-TIMES saw the sculpture and wrote a story, "Skyscraper 'Dad' Homeless". In the story, the author mentioned that SEAOI was still looking for a site. Still a place could not be located and, after display at City Hall, the sculpture had to be put into temporary storage. Considering Dr. Khan's contribution to Chicago, this was depressing. None of the Chicago's museums, nor the building management for some of the buildings which Khan designed, wanted the sculpture. Chicago is sometimes referred to as the architectural capital of the United States if not the world. Architectural tours are big business in Chicago but the engineers contribution in creating Chicago's famous skyline remained obscure. On May 8, 1989 the sculpture was formally dedicated in the plaza. Chicago Mayor, Richard M. Daley, cut the ceremonial ribbon. Once again the media was invited. Paul Gapp, Chicago Tribune architectural critic, was a speaker at the dedication. "Chicago owes thanks to the Structural Engineers Association of Illinois for commissioning this memorial. This is a city where the names of Sullivan and Wright and Mies come easily to the tongue. Now, perhaps the name Fazlur Khan will be more clearly remembered as another giant of architecture and engineering," said Gapp. Bill Lavicka, an SEAOI past president, stated, "This is our structural engineers gift to all Chicagoans. We hope that this sculpture will generate public awareness of this great man and his profession, structural engineering." Nonetheless, there was little mention of the sculpture in the Chicago press, other than the commentary by Gapp, a champion for the accomplishments of Khan. For several years the sculpture remained on display in its outdoor setting. In early 1990 the sculpture was hidden from view as the plaza underwent restoration. When the plaza reopened in August, 1990, a public ceremony was held. Press stories announced the new plaza and dressed-up surroundings for Miro's "Miss Chicago" sculpture, but none of the stories mentioned the Khan Sculpture. Minor deterioration in some of the welded connections began to show soon afterward, in 1991. An indoor setting was needed if the sculpture was to last. Once again SEAOI looked for an appropriate site for the sculpture. Realizing bold measurers were needed and realizing the media's penchant for negative news, I took a chance and announced the deterioration of the sculpture to the press. Shortly thereafter, on the front page of the Chicago SUN-TIMES, a story appeared, "Loop Sculpture Rusting On Its Laurels." The story criticized the structural engineers for being so stupid as to have located the sculpture outdoors, while failing to mention prior difficulties in obtaining an indoor site. About that time, the Sears Tower was undergoing a change in management. Sears had abandoned its building to move to the suburbs, and the new management had plans to update the building. A new skydeck entrance and architectural exhibit were under consideration. SEAOI approached the building management to find out if they would display the sculpture. In early 1993, an agreement was reached between SEAOI and the building managers for the Sears Tower. The sculpture was refurbished and moved to the tower that spring. That summer, the sculpture was moved to its current position. Since then, it has been adjacent to the elevators where visitors to the Sears Tower ( Now Willis Tower) enter or exit the skydeck ticket purchase area. Millions of people now have the opportunity to view the sculpture.